In celebration of St. Patty’s Day I realized you don’t just have to wear green to celebrate, I could smoke a green cigar! The candela wrapper is often over looked because of its bright green color, but in fact it used to be extremely popular in the early half of the 20th century. The green color is not from the leaf being young; it is actually from the curing process which preserves the chlorophyll. The candela I chose to smoke is one of our most popular candelas, the Corona Dominican 10th Anniversary in the specially made Wedge size, popping the cap off instead of a traditional cut, leaving me with a nice open draw that hinted of the sweetness to come. The entire cigar was very smooth, typical of a candela. For being a mild cigar, it packed a lot of flavor which was very enjoyable. This Cuban-seed Dominican candela has something for everyone; a hint of spice through the roll and a light earthiness through the whole smoke. 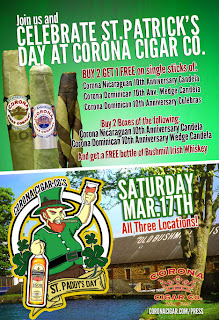 For those of you hesitant on smoking a green cigar, let back your inhibitions this St. Patty’s Day, and enjoy the specials we will be having at all three locations. 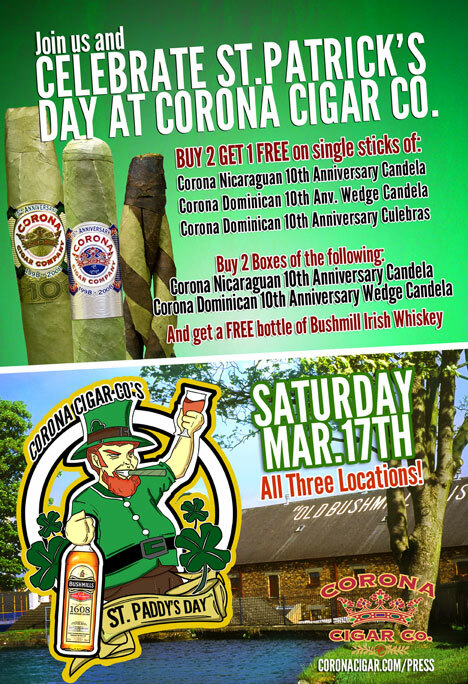 We will be holding specials Saturday March 17th on all of the Corona 10th Anniversary Candelas. Buy two singles and get one free or buy two boxes and get a bottle of Bushmill Irish Whiskey for free! Talk about luck of the Irish!